France has a long history with animation and traditional comics. So it is little surprise that some of the more original and unconventional animation would be produced there. Some of these animated features are more a work of moving art which is where Belleville Rendez-Vous firmly sits. The Belleville Rendez-Vous is a silent film with the odd musical number here and there, as well as a few other sound effects now and again. It tells the tale of Madame Souza who is an elderly woman raising her grandson. The film suggests that his parents are no longer around and that he is very sad and lonely. She tries, unsuccessfully, to get him interested in hobbies like the piano but to no avail. Then she buys him a puppy (Bruno) which seems to do the trick for a while but again he becomes withdrawn from the world. She discovers that he has an interest in cycling – after finding clippings removed from her newspaper and then buys him his first tricycle. After much training he enters the Tour de France during which he is kidnapped. Madame Souza realises this and what follows is the journey and ensuing capers as they try to rescue him. 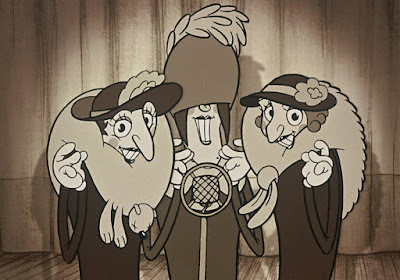 These capers involve the French mafia, an aging musical trio and a rather overweight dog. 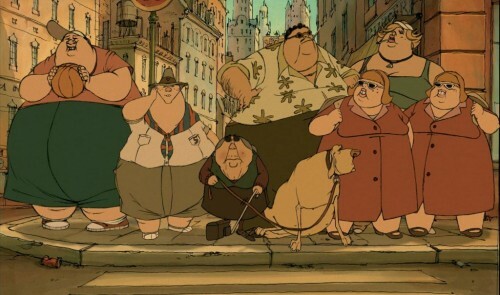 Belleville Rendez-Vous (or Les Triplettes de Belleville) was released in 2003 and was nominated for two Academy Awards for Best Animated Feature and Best Original Song in 2004. It is the first feature-length production written and directed by Sylvian Chomet (who also directed The Illusionist). This is a very odd film. Don’t get me wrong, I enjoyed it a lot but it has a strange look and at times is quite grotesque, bordering on surreal. Up front, this is not a film for everyone but if you have an open mind for visual style you will be rewarded. Early on I found myself thinking “what am I watching?” but as it progressed I got into it. There were a few “what on earth...?” moments in the second and third acts, but by that point I was totally bought into the world that they were in. Even if at times it was so bonkers it seemed to defy “cartoon” laws of nature it worked as a whole. 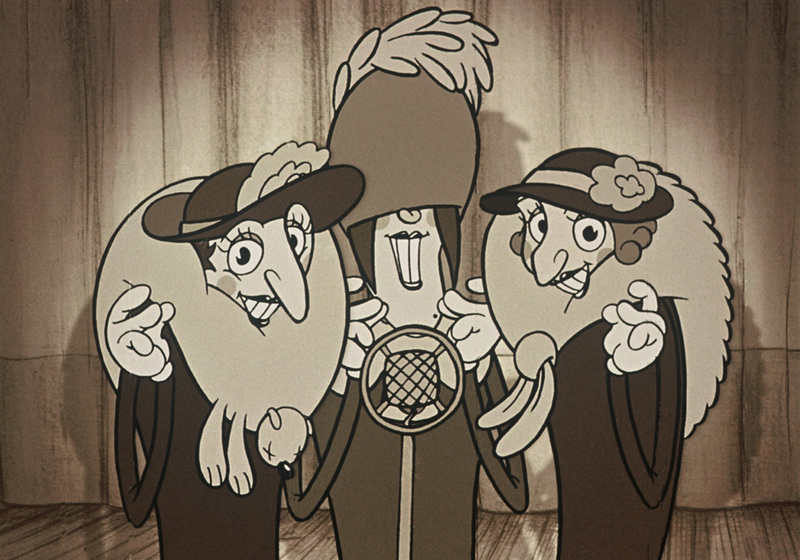 The film opens with a 1920s style harmony group (The Triplets of Belleville) performing at a variety show. Here we are treated to some grotesque stereotypes (the kinds of images I would not really want to post) and some odd surreal moments. The only thing I can liken it to are the old bawdy sea-side postcards. This opening segment, in a sepia-black and white is in some ways at odds with the rest of the film until the third act where it all begins to make some kind of sense and it links up again with the story. There were a few points I had to question what I was watching and why, but I was enjoying it. Even my mother (who is French) looked perplexed at this feature. We find out that this variety show is being watched on a TV by Madame Souza and her grandson. This bring us into the period that the film is set which feels difficult to define. Perhaps early to mid 20th century? Perhaps a bit later? There are hints of technology, lots of traditional machinery and early 20th century designs that it seems hard to place. Throughout the rest of the opening act we are shown the attempts of Madame Souza trying to bond with and enthuse her grandson. His parents are not with him and there is a genuine sense that he has withdrawn from the world and that his grandmother wants him to return to it. She buys him a puppy, Bruno, which seems to work but then he withdraws again. After finding out that he has an interest in cycling she buys him a tricycle. Once he gets it he seems to come back, Bruno almost forgotten. 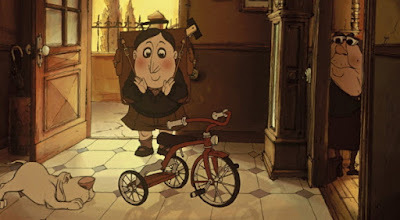 We are then treated to an absurd training regime sequence with Madame Souza on the tricycle, following her grandson around during his training for the Tour de France (by now he is a bit older and has a racing bike), blowing her whistle so he sticks to the cadence. After such training she could have entered the race! On their return home there is a bizarre massage on the dining table that involves a whisk and push-pull lawn mower. This is all rounded off with some grey food and the grandson collapsing into bed exhausted. So much for his reconnecting with the world, he either has a single-mindedness for training ... or he is physically wrecked. The second act of the film sees us join the Tour. This is probably the most lively and bright section of the film. You get a sense of the pomp and splendour associated with the Tour and there is a real carnival atmosphere. Then you see the cyclists going through hell. What struck me here was the variety of characters in the crowds as they cheered the riders on. Every body type and nation is represented in some way. There is so much going on in the frames in terms of motion and colour, even when there may only be two characters in view. There is a lot of detail being displayed. It is within this act that Belleville Rendezvous transitions from a typical sporting feature to a crime caper and I got into the story much more. Up to this point I was not really sure what was happening but I was enjoying looking at what was on the screen. Without wanting to spoil the film there are some lovely moments in the second and third act. 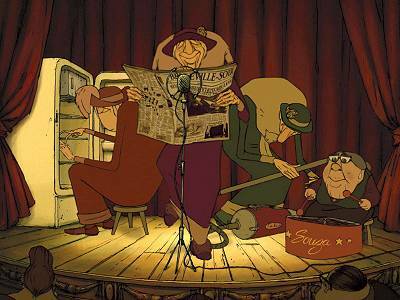 The link between the opening sequence and third act is that Madame Souza ends up teaming with the Triplets of Belleville. They are a very odd trio. They behave very much like children stuck in elderly bodies and their choice of food is ... interesting. The fishing sequence was particularly striking, a mix of comedy and the gross – a frog-shower is created to provide dinner. They could have easily been witches in another film. The performance of the Triplets, accompanied by Madam Souza on percussion was sublime for the sound, movement on screen and the creativity of the instruments. It brought to mind the stage show “Stomp” and a percussion workshop I did for work that made use of grills, tubes and shopping trolleys. I’ve hinted at the colour palette above and, much like The Illusionist, it tends towards pastel shades. Whereas The Illusionist had reds and blues in addition to the those associated with town and countryside, this feels brown, grey and green. The interiors feel dark, dirty and faded. The training montage is at night and looks almost as if the film is ill. My lasting memory of the Tour de France sequence is that of dust. It feels dirty and squalid in its colours and tones even though we see all of the colours in the rainbow. The scenes in urban areas feel grey and polluted. The palette certainly matched the tone of each of the scenes beautifully. It’s not all drab and faded. There are flashes of colour. The support “crew” and cheer leading vehicles in The Tour are a huge contrast to the dirt and hardship of the race. There is a carnival quality to it. If only the character designs were more attractive! The characters reminded me of Da Vinci’s grotesques. It’s as if the designers took “standard” faces and people and decided to stretch one feature to an extreme. In some cases this feature was one you would associate with the country. This also included behaviours and actions. At times is looked and played out a bit like Spitting Image. Madam Souza’s grandson has a very long and pointy nose and, because he is a cyclist, massive thighs and calf muscles. Bruno has become a very fat and unhealthy dog. The French mafia (who make an appearance) are presented as heavy wine drinkers wearing large blood-shot noses. One of the cyclists that drops out of The Tour is shown as panting heavily as if, for the rest of his life, he will be forcing air into his lungs to recover from the extremes of the race. Combining the colours, the character designs and visual quirks gives this feature a very distinct and unique look. Even Madame Souza, the hero of the hour, is shown to be a short-sighted, short old lady with one leg longer than the other. She is nothing but earnest, well-meaning, thoughtful and considerate throughout the whole film. Has she been characterised differently, this film would not have worked at all and would have been very hard to watch. Comparing this and The Illusionist is inevitable. Both by the same creator and both are silent films. The Illusionist has a broader appeal, the designs of the characters and the story can be enjoyed by everyone. The quality of the animation, the movement of the characters, facial expressions to convey emotion is far higher in Belleville. If the character designs were more “attractive” this would definitely be a must see. That’s why I think of it as more of a piece of art than entertainment. Belleville Rendez-Vous is not for everyone. It is a wonderful example of “silent” film. If you enjoy animation because it tells different stories in unique ways with distinctive characters and a lots of detail in every scene then it is definitely worth watching. It really is a work of art. With the film bordering on the grotesque a lot and at times crossing a line with its imagery it makes it hard to recommend to everyone. Belleville Rendez Vous is available on DVD, Blu-Ray from Tartan and streaming from Amazon in the UK. In the USA it is available on DVD and Blu-Ray from Sony Pictures and streaming.